VUE Audiotechnik is committed to redefining “state-of-the-art” loudspeaker performance by re-examining each element in the loudspeaker equation and then leveraging the most advanced technologies to push past the status quo. This willingness to look beyond today’s more conventional solutions compelled us to form a strategic development partnership with Materion Electrofusion, the world’s leading supplier of acoustic beryllium. Thanks to its extremely high stiffness-to-mass ratio, beryllium outperforms both aluminum and titanium by dramatically reducing mechanical deformation (breakup), and shifting resonant frequencies outside the audible range. As a result, beryllium offers the potential to advance loudspeaker performance well beyond today’s “state-of-the-art” systems. Over the last decade, Materion Electrofusion has pioneered numerous manufacturing techniques that have further improved beryllium’s performance advantages while also reducing overall production costs. By uniting Materion’s beryllium technology with VUE’s extensive design and manufacturing capabilities, we’re now able to bring beryllium transducers out of the esoteric high end and into broader sound reinforcement applications. As a result, VUE engineers are actively developing a full range of compression drivers that feature Materion’s Truextent® beryllium diaphragms. These revolutionary HF transducers will form the foundation for an expanded range of ultra high-performance professional loudspeakers capable of delivering measurable improvements in everything from response linearity to output and long-term durability. The first result of our development partnership with Materion was the massive 4-inch diameter compression driver found at the heart of our h-12 and h-15 active two-way systems. This revolutionary HF driver features a Truextent® beryllium diaphragm with very high output and low distortion up to 20,000 Hz. These h-Class systems pair this powerful device with equally advanced LF transducers as well as active electronics that include driver-dedicated amplification and system-optimized DSP. 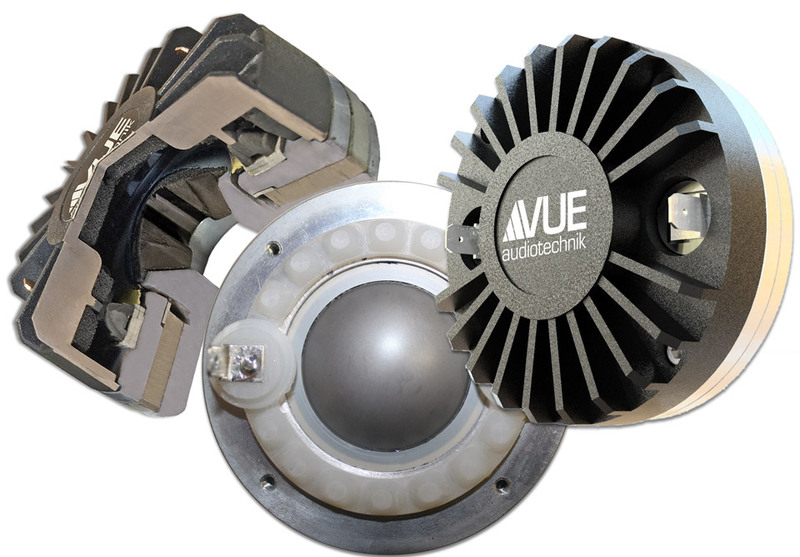 Following the h-Class, VUE engineers developed a smaller, 1-inch exit compression (1.3-ich voice coil) compression driver for use in our al-4 Subcompact Line Array System and al-8 dual 8-inch based Line Array System. This smaller driver also features a Truextent beryllium diaphragm and is ideal for the ultra-compact al-4 acoustic element, where it’s mounted to a precision waveguide matched to a horn delivering 90-degrees of horizontal coverage (the al-8 combines a pair of the 1.3-inch drivers on a larger waveguide and horn with identical path lengths). The compression drivers are mated with Kevlar cone neodymium transducers that flank the HF device. All the al-Class systems are matched with a companion rack mont VUEDrive System Engine networked dsp-processor / amplifiers to complete the systems. The new al-12 Large-format Line Array System incorporates a pair of 3-inch voice coil compression drivers that were designed from the ground up to take full advantage of beryllium’s extended high-frequency bandwidth. It features a unique designed high-pressure die-cast phase-plug optimized for output above 10,000 Hz resulting in output up to 30k Hz. VUE’s latest engineering effort to utilize beryllium is our e-Class system, our first system with a beryllium dome tweeter. This new 25 mm dome similar that found in some of the best (and most expensive) esoteric HiFi speakers systems produces output beyond 30k Hz. To reach the output levels demanded in professional applications the dome is mated to a very powerful Neodymium magnetic circuit enabling output levels 6 to 10 dB more output than typical direct radiating dome systems. Thanks to their unique beryllium transducers, the h-Class, al-Class and e-Class deliver dramatic improvements in both HF extension and response linearity – far beyond what would have been possible with more traditional aluminum or titanium components. The h-Class and al-Class systems are only the beginning. Today VUE engineers are actively developing an expanded family of beryllium compression drivers for use in finished systems targeting a broad range of applications from commercial audio to portable PA and touring sound. At the same time, our R&D team is also exploring other unique ways to leverage the benefits of beryllium and advanced hybrid materials beyond just HF devices. Beryllium’s near perfect pistonic motion results from its extremely high stiffness-to-mass ratio, dramatically reducing mechanical deformation (breakup) and shifting resonant frequencies outside the audible range. Beryllium resonance is 2.6 Times Higher than titanium or aluminum of the same size as shown by this plot of machined tuning forks exactly the same dimensions. 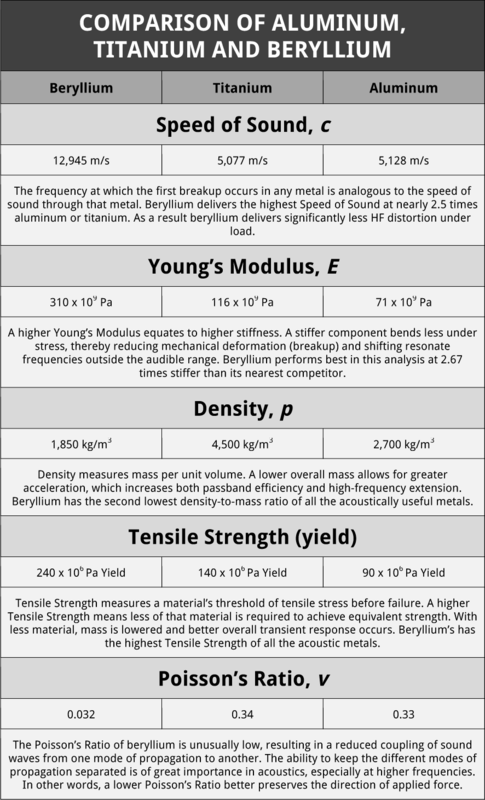 If you’d like to learn more about the science behind acoustic beryllium, here are some “must-read” resources to get you up to speed. Tuning forks: Let Your Ears Do The Math! This fascinating paper by Materion’s Peter J. Andrews offers an entertaining method for demonstrating beryllium’s unique abilities. By utilizing three tuning forks of the exact same dimensions (one each of aluminum, titanium, and beryllium), Andrew’s strikes the forks to show how much faster sound travels through beryllium, as it resonates at a much higher frequency than the other two. 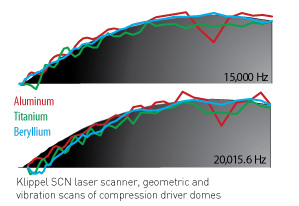 Beryllium dome diaphragms whitepaper presented at the 2011 ALMA European Symposium. This paper compares genuine Truextent beryllium to titanium and aluminum and shows Materion’s Truextent brand is indeed the superior material. Materion provides safety information for a variety of their products and materials. 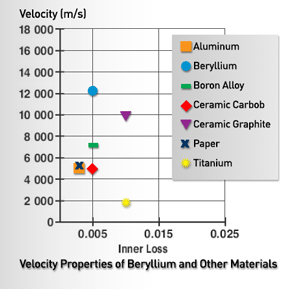 This link will take you to the Material Safety Data Sheet (MSDS) for Beryllium. VUE Products with Truextent high frequency diaphragms include: h-12, h-15, h-8, h-5, hm-112, hm-212, al-4, al-8 and al-12. Truextent is a registered trademark of Materion Brush, Inc.